Dubai: A study carried out by leading UAE based eCommerce company AWOK.com revealed that 80% of the shoppers accessed the online shopping website using mobile phones, 18% through desktops and 2% via tablets. UAE ranks high on the world map of mobile penetration, which is reflected in the rise in the mobile shopping trend. Despite the bullish trend in online and mobile shopping in the UAE, the study reveals that 75% of customers prefer to pay cash/card on delivery vs. the 25% that opt to pay online. A 2016 Gartner report says, ‘About 80 percent of online shopping in Middle East is done using cash-on-delivery. This makes the transaction less efficient, takes a longer time to complete the delivery, and tends to have a higher return rate’. “There is great opportunity for eCommerce businesses and payment providers to work closer to offer multiple payment options that consumers in the UAE can use safely and conveniently. We have seen an increase in the percentage of customers choosing to pay online, which indicates growing trust among consumers in this sector. The study also highlights that online shopping is immensely more popular among men than women in the UAE. 74% of the shoppers on the website are male and 26% are female, and the typical online customer is between 25 to 34 years old. 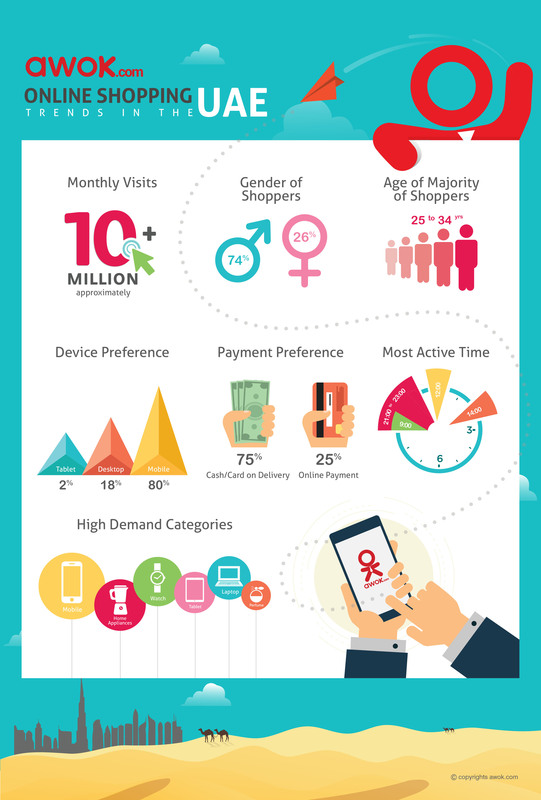 “The statistics that we have reflects the pulse of the country’s online retail sector. At AWOK.com we watch the trends closely to consistently develop exceptional experience for consumers as well as constantly improve our offerings”, concluded Yuldashev. AWOK.com is a dynamic ecommerce business that was founded by Ulugbek Yuldashev in April 2013. In just three years, it has grown to become one of the leading online shopping destinations in the UAE that attracts approximately 10 million visitors per month and has close to 500 employees. The online retailer has managed its own fulfillment center and logistic since day one of the business. The site initially sold electronics and gadgets; today, AWOK.com offers approximately 50,000 products across 30 plus categories. It is a safe and easy to use online retail facility that offers customers the flexibility to pay online or cash on delivery.